Stop Rushing and Start Succeeding: Part 3 | Go From Stress To Success! In the previous blog in this series, we went over the beliefs that push us into rushing, and how many of those beliefs create a stressful situation. In this final blog in the series, we’ll go over why stress pushes us into a vicious cycle, four ways to stop that cycle in its tracks, and three questions to ask ourselves to move out of busy, pointless motion and into productive, focused action. 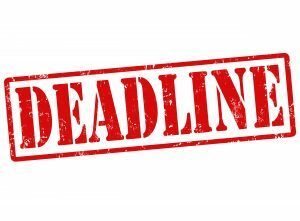 Many people begin to rush when they feel stress – the stress of an impending deadline, for example. The exam that’s just around the corner, the paper that’s due on Wednesday, the project you had to finish so you could present on it tomorrow – all of these are sources of stress. But when you react to the stress by rushing – by going into fight-or-flight mode – you create a situation where rushing feels like the right thing to do. When that happens, you’re more likely to continue to react to stress by rushing. Rushing also creates stress. The feeling of impending doom, of the sky falling, of the world ending because you’re not done yet – all of this creates stress. So we get into this vicious cycle where stress causes us to rush, and then rushing causes more stress, which then makes us need to rush, and around and around we go. Many people report that when they try to slow down for the first time, they feel anxious and uneasy. They are used to the adrenaline rush that comes with the panic of the rapidly approaching deadline. They are used to the endorphin rush that comes with succeeding in the face of seemingly impossible odds. What this means is that they’ve developed a habit of being in a hurry, and slowing down feels wrong. They’re used to being on high alert, and standing down from that feels weird. Biologically, endorphins and adrenaline can be just as addictive as any other drug! We don’t call people “adrenaline junkies” for nothing! But being constantly hyped up on adrenaline is not good for you. So how do you stop when you feel that stressful urge to rush? Here are four steps to take. 1. STOP. When you begin to feel the effects of adrenaline, stop in your tracks. Let your racing heartbeat and rapid breath trigger you to stop and take stock of what’s going on. 2. BREATHE. Take a deep breath. Hold it for a count of five, and let it out. Do this a couple more times to bring your breathing and your heartbeat back into some reasonable range. 3. WALK. Get up from wherever you’re sitting, and walk slowly and deliberately to the water fountain, bathroom, or the end of the hall and back. Focus on your steps. Focus on the moment. The idea is to get your brain back into the here and now. 4. LIST. If your mind is still racing with all the things you have to do, write down a list of everything that’s racing through your mind. Get it out of your head so you can look at it. Then put each item on the list into your planner or calendar, so that you can get to it when you have time, instead of being overwhelmed by it yammering away in your head. Once you’ve stopped, taken a breath, taken a walk, and listed what’s stressing you out, it’s time to ask yourself three questions so you can slow down and move forward. 1. If I could only get one thing done today, what one thing do I want that to be? This question may be difficult for those of us who think we can multitask and rush through our work. But it’s crucial to make us stop rushing and start focusing. It’s better to finish one task than to half-finish half a dozen tasks. The finished task will no longer be on your to-do list and stressing you out. It will be done. So decide what is your first priority today, and make that the main thing you will focus on and work towards. Todd Henry, in his book Die Empty: Unleash Your Best Work Every Day, suggests that you create three kinds of goals: stretch goals, sprint goals, and step goals. 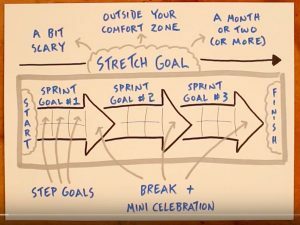 A stretch goal is a long-term goal made up of several sprint goals. Each sprint goal is formed from a number of step goals. Doug Neill, of Verbal to Visual, created this sketchnote of Todd Henry’s three types of goals and how they go together. Click the picture to see his sketchnote video! Each of these goals takes a different amount of time. A step goal is a single step on the way to a goal, so it usually takes the form of a task that you put on your daily calendar. A sprint goal is a combination of steps towards one big milestone. Think of this as a theme for the next week to two weeks. Finally, a stretch goal is the entire project. Your daily priority should always be a step goal. So take your project, break it up into sprint goals, and break that up into step goals. Then decide which step you’re going to take today – and take it. 2. Is what I’m doing right now motion, or action? How do I know? Motion feels productive, but doesn’t make steps toward your goal. Action actually does. If your goal is to get your research paper finished, and you’ve pulled 12 books from the school library but now they’re just sitting on your desk, then that was just motion. You may have felt productive lugging all those books to your desk, but if they’re just sitting there, you’re not taking action. However, if you brought the books to your desk, planned a series of step goals to go through one book each day to get citations and resources for your paper, and you’re actually doing that, that’s action. Action means you’re focused on the step you’re taking right now, and making sure you make the most of it. Motion means you’re trying to rush through it because you have a million more steps to take and your mind is focused on them, not on the present moment. You can only take action in the present moment, so if you find yourself trying to go through one of your sources while your mind is harping on you to hurry up because you have to write your first draft, it’s time to refocus yourself on the current step goal and stay with it until you’re done. When you have a list of step, sprint, and stretch goals, it becomes much easier to take action instead of just being in motion. 3. How will I reward myself for finishing my priority step goal today? Too many times, the only reward hurried people get for finishing something is that endorphin rush that comes when the stressor is over. In order to get away from the addictive cycle of adrenaline + endorphins, it’s time to find other ways to let your body and your mind know that you’ve accomplished something. You want to wean yourself off the rush and move toward some better reward instead. When you finish a step towards your goal, reward yourself. To a rushed person, this can sound pretty strange. We don’t usually reward ourselves for our successes, especially if we’re stuck in the vicious cycle of a rushed mindset. Rushed people tend to have what’s known as a “future orientation,” because we keep looking at what’s next, rather than what’s now. When we’re rushed, our focus is never on what we’re doing – it’s always on what we still have to do. But recognizing our progress will bring us back to what’s now – and that’s important, because part of learning to slow down is learning how to stay in the present, instead of projecting endlessly into the future. Doug Neill of Verbal to Visual, on YouTube, took Todd Henry’s step, sprint, and stretch goal ideas and created a sketchnote out of them. But he also added something important to the mix: when you finish a step goal, give yourself a small reward. When you finish a sprint goal, give yourself a bigger reward. And when you’ve finished your stretch goal, it’s time to have a party. The Step Reward: James Clear of jamesclear.com suggests that a small reward can be something as simple as saying “I am awesome!” when you’ve finished a step toward your goal. You could also create a punch card and give yourself a latte for every ten steps you complete. You could go for a run or take a swim, if that’s your thing. One person I know sends themselves an email through futureme.org and sets the date that they’ll receive it for a few weeks or a month in the future. Writing the email is one reward, and receiving it is another – two for one! The main thing about step rewards is that they shouldn’t be expensive, but they should be meaningful. The Sprint Reward: A medium reward could be something like going out to lunch with a friend, or treating yourself to a movie, or buying that new best-seller novel you want to read. Maybe you want to go to the beach for the afternoon, or take a drive. There are dozens of rewards that fit in this category. The way you know it’s a sprint reward is that it’s a small cost, but it feels good and lets you relax, and it lasts longer than a step reward. You’ve sprinted, and now it’s time to kick back a little bit. The Stretch Reward: A large reward for finishing a stretch goal might be a weekend off, or a night out on the town, or a new bicycle, or a fun class you want to take (cake decorating? flower arranging? learning to beatbox?). A stretch reward should be something that creates memories you can hold on to, and something you can look back on and still feel good about later. Stress leads to rushing, which produces more stress, which leads to more rushing. Managing your time and managing your reactions will go a long way toward reducing your stress, and thus reducing your need to rush. Identifying your main goal and your current step toward that goal will give you focus, instead of scattering your work in a whirlwind of motion that doesn’t move you forward. And rewarding yourself – well, we all could use more of that, right? Try it today and let me know how it goes! Comment here or send me an email – I’d love to hear from you! Posted in Best Practices, Studying and tagged anxiety, college help, college stressors, for students, hurrying, rushing, scheduling, stress, time management.